It is my honor to serve as PVA’s President. My company, Padelford Packet Boat Co., Saint Paul, MN, has proudly, and actively, been a member of this organization since its inception almost 50 years ago when it was previously known as the National Association of Passenger Vessel Operators (NAPVO). While PVA is rich in history, it by no means is stuck in old ways. PVA is always evolving to mirror the ever-advancing world of passenger vessel operations. 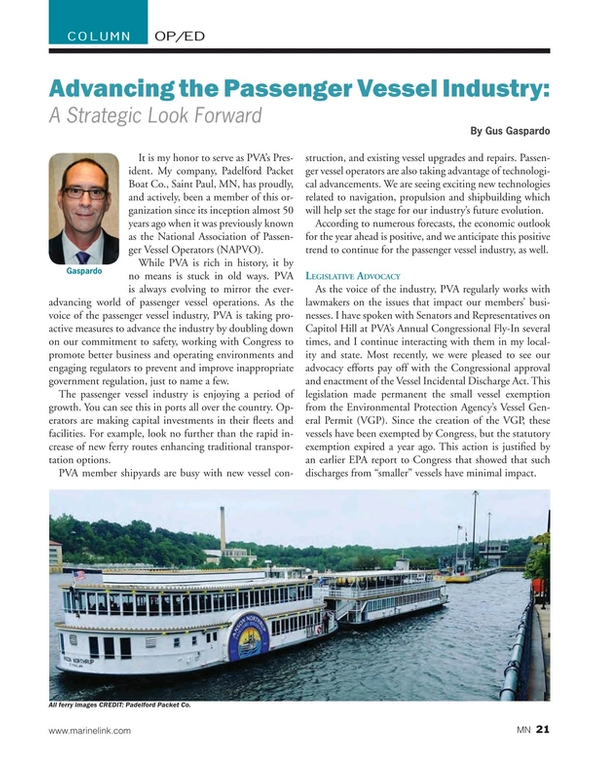 As the voice of the passenger vessel industry, PVA is taking pro-active measures to advance the industry by doubling down on our commitment to safety, working with Congress to promote better business and operating environments and engaging regulators to prevent and improve inappropriate government regulation, just to name a few. The passenger vessel industry is enjoying a period of growth. You can see this in ports all over the country. Operators are making capital investments in their fleets and facilities. For example, look no further than the rapid increase of new ferry routes enhancing traditional transportation options. PVA member shipyards are busy with new vessel construction, and existing vessel upgrades and repairs. Passenger vessel operators are also taking advantage of technological advancements. We are seeing exciting new technologies related to navigation, propulsion and shipbuilding which will help set the stage for our industry’s future evolution. According to numerous forecasts, the economic outlook for the year ahead is positive, and we anticipate this positive trend to continue for the passenger vessel industry, as well. As the voice of the industry, PVA regularly works with lawmakers on the issues that impact our members’ businesses. I have spoken with Senators and Representatives on Capitol Hill at PVA’s Annual Congressional Fly-In several times, and I continue interacting with them in my locality and state. Most recently, we were pleased to see our advocacy efforts pay off with the Congressional approval and enactment of the Vessel Incidental Discharge Act. This legislation made permanent the small vessel exemption from the Environmental Protection Agency’s Vessel General Permit (VGP). Since the creation of the VGP, these vessels have been exempted by Congress, but the statutory exemption expired a year ago. This action is justified by an earlier EPA report to Congress that showed that such discharges from “smaller” vessels have minimal impact. Additionally, the passage of the Coast Guard Authorization Act included several other provisions for which PVA has vigorously advocated. These include directing the Commandant of the Coast Guard to improve consistency in interpretation of regulations and standards by Coast Guard marine inspectors; easing the 2010 law requiring “official” logbooks, which previously included redundant, cumbersome and unnecessary recordkeeping requirements; and instructing the Coast Guard to move forward in issuing a final rule eliminating the requirement for formal radar refresher training for certain mariners who routinely use radar in regular vessel operations. While new regulatory activity has fortunately slowed to a trickle under President Trump’s directive, PVA is taking this opportunity to expand its efforts to reduce regulation on the passenger vessel industry even further. Along these lines, the PVA Regulatory Committee is taking a look at existing regulations to identify opportunities to improve, adjust, or even eliminate them altogether. We were recently successful in right-sizing the rules for marine casualty reporting. PVA successfully urged for the issuance of the final Coast Guard rule increasing the property damage dollar thresholds for reporting a marine casualty and serious marine incident. These damage thresholds had not been updated since the 1980’s and increasing them benefits operators by decreasing unnecessary paperwork and reporting and enables the Coast Guard to devote its resources to truly major events. We commend the Coast Guard for this common-sense regulatory step. We are seeing an unsettling expansion of illegal charter operators in ports across our Nation. These illegal operators are skirting regulation created to protect passengers from harm and, as a result, creating a hazard to public safety. PVA is vocally opposing these illegal charters, and is working closely with Coast Guard to combat this issue. Fortunately, we are making progress but the job is not yet done. PVA has engaged in an ongoing cooperative effort with the Coast Guard that is yielding results in the form of increased enforcement against these offenders. These enforcement actions carry real consequences for illegal charter operators, including detained vessels and thousands of dollars in civil fines. PVA members have established a website with information on how to report an illegal charter. We encourage everyone to visit www.illegalcharters.com and learn more about this pressing safety issue and see how you can help us in the fight to protect passengers. PVA is committed to safety and we work closely with our Coast Guard partners to enhance our safety efforts. The passenger vessel industry has more than 50 years’ experience with the Coast Guard in vessel inspections. PVA members are well-versed in the regulations governing our industry and, as a result, can point to good relations with Coast Guard inspectors and, accordingly, a solid safety record. Because of this, we are very pleased to see the Coast Guard continue to promote the use of its Risk-Based Decision Making Matrix for Small Passenger Vessels Annual Inspection Activity policy. This policy provides local inspectors the flexibility to evaluate passenger vessels and reward safe operators, based on a matrix of criteria, with a possible de-scoping of their inspection, thereby lessening the time required by inspectors at those vessels. PVA’s strong working relationship with the Coast Guard doesn’t end with inspections. Through our Quality Partnership meetings with Coast Guard leadership, we have established a working group to develop recommendations regarding Lithium-ion battery installations for small passenger vessels. The group has begun work to develop mutually agreeable design guidance for future applications. PVA is drawing on its members’ expertise including those professionals in marine architecture, design, construction, and operation. The goal is to create non-regulatory solutions to challenges facing both industry and Coast Guard. Similar to the maritime industry at-large, PVA has heard from operators in ports all over the country about the challenges of hiring and retaining mariners. To assist its members, PVA has launched an initiative with several state maritime academies to connect operators with cadets. Through this partnership PVA has learned that the cadets from these academies are not only specializing in education programs focused on traditional “deck and engine” majors, but also on positions in safety management, security, and environmental stewardship. Maine Maritime Academy and Massachusetts Maritime Academy are now PVA Associate Members, and we will continue our efforts to add additional maritime academies to PVA’s membership roles. It is no surprise to anyone that with a strong economy there are more boats on the waterways, both commercial and recreational. While this is certainly good news for all boating segments, PVA wants safety to remain a priority for all users as we share the Nation’s waterways. Over the years, PVA has been approached by passenger vessel operators expressing their growing concern about crowding on the waterways and the need for recreational boaters of all types to understand and adhere to the rules of the road As a result of these calls-to-action, PVA is actively engaging with other organizations in the recreational boating safety industry to develop standards and to get them out to the boating public. We appreciate working with, and the efforts of, the National Boating Safety Advisory Committee, the National Association of State Boating Law Administrators, the American Canoe Association (ACA), and the International Water Sports Foundation. Gus Gaspardo is President of Padelford Packet Boat Co. A founding PVA member, Padelford provides a wide variety of public cruises and private events on the Mississippi River with three passenger subchapter K vessels. Gaspardo attended Mankato State University and joined Padelford as a deckhand in 1984 and obtained his Masters license in 1986. Gus and his wife purchased the company in 2016. Gus has been a previous Chairman of the Regulatory Committee for PVA, and a past Rivers Region Chair. This article first appeared in the January 2019 print edition of MarineNews magazine.